Or should I say.. off with the tick! After taking a photo with my iPhone, I pulled it out* and threw it into a nearby sink. It promptly started marching away so I fetched a Zip-loc bag and put it in there until I could decide what to do with it. There are two main types of ticks around here: black-legged ticks and American dog ticks (also known as wood ticks). The dog ticks typically do not transmit disease while the black-legged ticks do. This one is a black-legged tick as it lacked the white markings on the back that dog ticks have. It turns out that you can send ticks in for analysis (PDF). They test the tick for Lyme disease, among other things, and will email the results. This can take weeks so don't rely on this to tell you if you have Lyme disease! 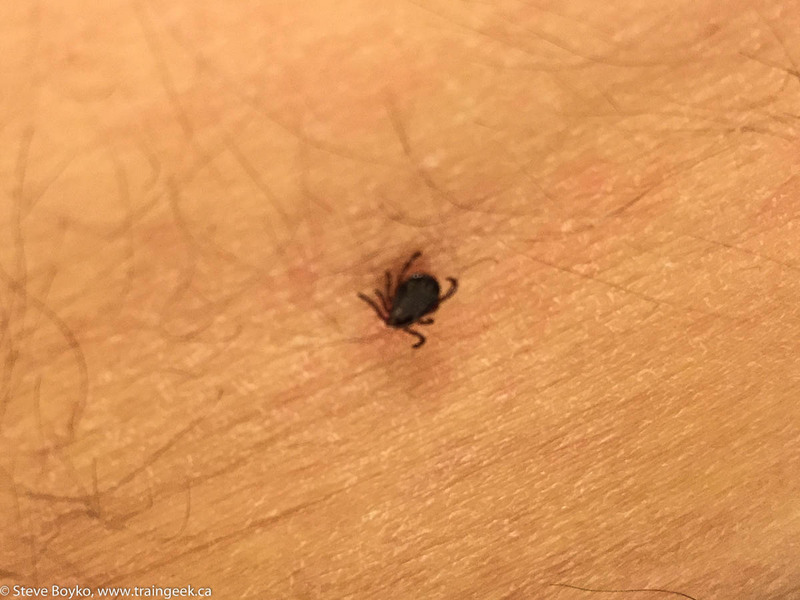 Symptoms of Lyme disease include a characteristic ring around the entry area, headaches, fatigue, fever, chills, rashes, numbness or tingling... there are quite a few. Here's a close-up of my little friend, before I sent it off for analysis. I've been keeping an eye on the area for signs of the characteristic ring around the entry area, but so far nothing has appeared and I feel fine. The tick wasn't engorged so it hadn't fed much, so the chances of any infection are low. I washed the area with soap and water and then applied alcohol to try to sterilize it. * you remove ticks by pulling them straight out, with your fingers or with tweezers. Try to remove the entire tick without squeezing it. Don't apply any chemicals, grease or anything like that - they don't work. So - public service announcement - after tromping around in the wilderness, be sure to check yourself and your companions for ticks! 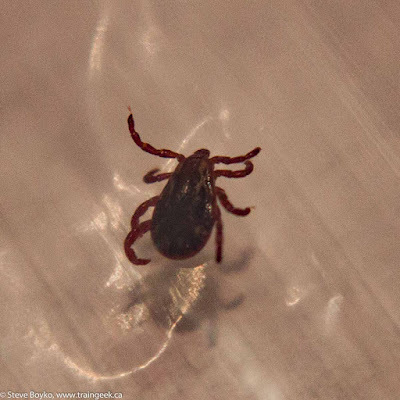 UPDATE: Manitoba Health emailed me on July 29th to let me know that the tick I sent in was "an adult American dog tick, also known as a wood tick." These ticks do not transmit diseases to humans.